OCP Verification IP provides an smart way to verify the OCP component of a SOC or a ASIC. The SmartDV's OCP Verification IP is fully compliant with standard OCP Specification 3.1 and provides the following features. Compliant with OCP 3.1 specification. Supports OCP Master, OCP Slave, OCP MOnitor and OCP Checker. 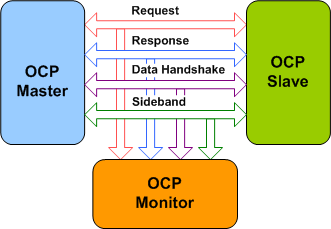 Supports all OCP protocol transfer & command types. Supports all OCP protocol signal widths including address and data. Supports all OCP protocol burst models, burst lengths and response types. SRMD and MRMD bursts support. Ability to pipeline transfers and non-blocking flow control support. Supports concurrency and out-of-order processing of transfers: Multi-threading and tagging support. Supports 2-Dimensional block burst address sequences. Complete support for full range of OCP configurations. Asynchronous/synchronous reset and EnableClk mechanism. On the fly reset control. Consistency checks for configuration parameters. Slave supports fine grain control of response per address or per transfer. Rich set of configuration parameters to control OCP functionality. Callbacks in master, slave and monitor for various events. OCP Verification IP comes with complete testsuite to test every feature of OCP 3.1 specification. Faster testbench development and more complete verification of OCP designs. SmartDV's OCP Verification env contains following. Complete regression suite containing all the OCP testcases. Examples showing how to connect various components and usage of BFM and Monitor.